The American 1st Marine Division is attacked by the Chinese 9th Army but the Marine commander Major General Smith is prepared for the attack. 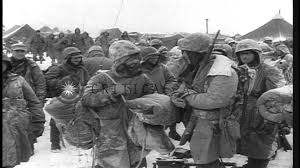 In some of the coldest weather in military history, the Marines although greatly outnumber, fight off the Chinese and break out to the South. The 10th Corp is taken out of North East Korea by ship. A biography of General Song the commander of the Chinese 9th Army. This episode will be released on Saturday 4th June.